Last night i was confused when i was installing Windows XP on my friend’s laptop, the installer didn’t recognize the laptop’s hard drive,i thought there was a problem with the hard drive. After googling for a while, i found that it was caused by Windows XP installer that didn’t support SATA hard drive. To overcome the problem, we have to include SATA drivers into Windows XP installation CD and reburn it, and fortunately, that’s not a complicated task to do :-). 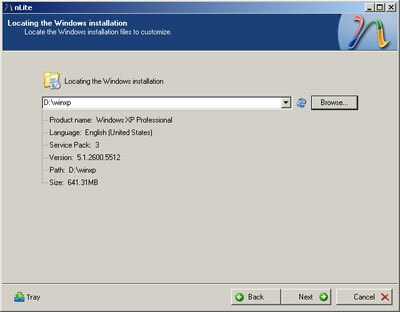 Ok, below i will present you step by step how to install Windows XP on Acer 6291 laptop. First of all, you need to prepare the Windows XP installation CD, Acer 6291 SATA driver (F6 SATA driver for XP installation.zip), nlite (freeware) and UltraISO (payware) program. 1. Insert your Windows XP installation CD into your CD/DVD room drive. 2. Extract F6 SATA driver for XP installation.zip file and you will get two zip file (f6flpy32.zip and f6flpy64.zip). 3. Choose f6flpy32.zip and extract it, you will find f6flpy32.exe file, extract f6flpy32.exe to get temp.IMA file. 4. Using UltraISO , open temp.IMA file and extract it into a folder. The next step is to integrate SATA driver into Windows XP installation CD using nlite. 5. Launch nlite, and click Browse to locate the Windows XP installation CD and folder into which your modification saved. Nlite will copy all Windows XP CD content into folder that you’ve specified. 4. Click Next and the next Next button to skip import step. 5. On Task Selection window, choose Drivers and Bootable ISO option, then click Next. 6. 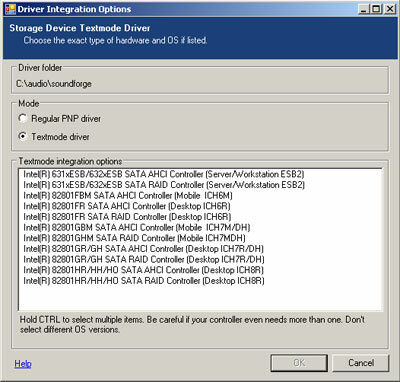 Click Insert and choose Single Driver, locate the extracted SATA driver, choose iaahic.inf file. 7. On Driver Integration Options window, choose Textmode Driver option and select all drivers listed, and click Next to continue. 8. On Apply Changes dialog box, then click Yes to start the process, click Next after the process finished. 9. After integrating SATA drivers, create an image file (ISO) for your new modification Windows XP installer. 10. Using burning tools like Nero, burn the image and then you can start install XP without any problem :-). For Acer’s driver for Windows XP, you can download it from Acer’s support website. 1. 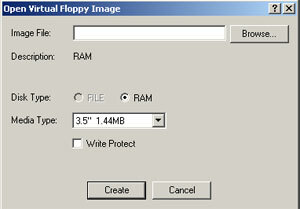 First, download Virtual Floppy Drive (VFD) package and extract it into a folder. 2. 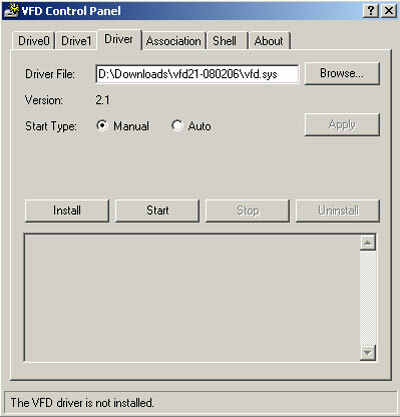 Look for vfdwin.exe from your extracted VFD files, and run it. 3. Click Start to start the driver. 4. 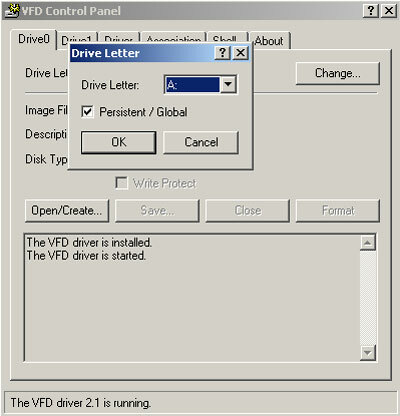 Create a virtual floppy drive on Drive0 tab, click Change to set drive letter for it. 6. Click Open/Create button and browse the temp.IMA file then click Open to open temp.IMA file and extract it into your virtual floppy drive. 7. Browse your 3 1/2 virtual floppy drive, you should see SATA driver files listed. thank you very match ! This step-by-step procedure saved my day. Thanks very much. Thank you for the guide on how to install it..
very clear detail to make it easy to work..
hank you for the guide on how to install Windows XP on Acer Travelmate. This step-by-step procedure is very easy to understand. Thanks for sharing with us. It is a woderful news .I have to use more of these ideas.Thank for your post, i really love it. I will come again. Nice description. I like it and I can work with it. However I can’t find the driver I need: Acer Aspire 5102WLMi notebook (processor: AMD Turion 64 x2 Mobile / chipset: ATI Radeon Xpress 1100). I have searched now for two weeks, tried a lot of drivers but none worked. I’m desperate, who can help me? Forgot: of course needed to install XP. I can’t extract the f6flpy32.exe file. where can I download the temp.IMA file? Hi, you can extract the f6flpy32.exe file using winzip or winrar..
What’s up colleagues, fastidious piece of writing and fastidious arguments commented at this place, I am truly enjoying by these. If your laptop is not designed to function on multiple currents, you will need an electrical converter to prevent damage. 8 inch TFT resistive touch screen is one of the main benefits of this phone, coupled with the fact that it displays 65,000 colours at 400 x 800 pixels. people could carry it everywhere and anywhere they go without being burdened by it. is what the majority of users do with their netbooks.